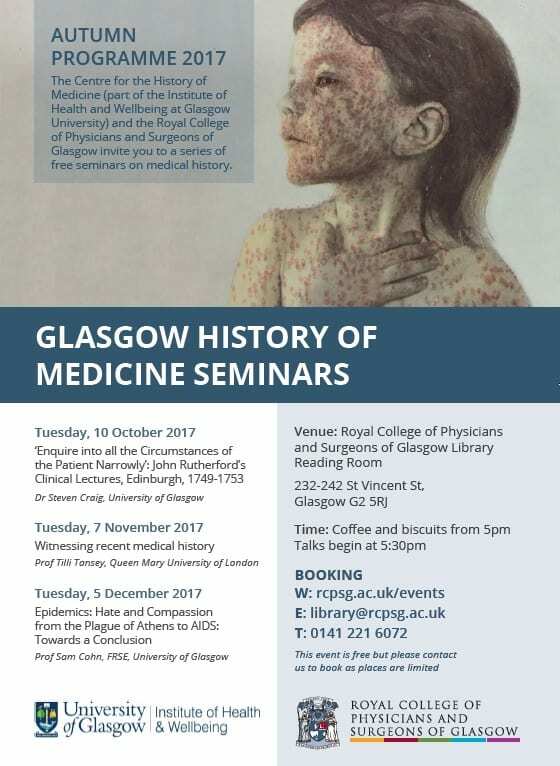 We have a fascinating line-up confirmed for our Autumn 2017 Glasgow History of Medicine Seminars in partnership with the Centre for the History of Medicine (part of the Institute of Health and Wellbeing at Glasgow University) – we hope you can join us! Dr Craig discusses John Rutherford’s pioneering clinical lectures which integrated medical theory and its application on the ward. Prof Tansey discusses the history of the Witness Seminar and the ways in which we can record and preserve the history of biomedicine. Prof Cohn takes a look at epidemics throughout history and argues that instead of sparking hate and blame across time, epidemics have shown a remarkable power to unify societies. 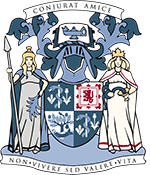 The seminars take place at 5:30pm (tea/coffee from 5pm) in the library reading room at the Royal College of Physicians and Surgeons of Glasgow. They are free to attend but please contact library@rcpsg.ac.uk or call 0141 221 6072 to book as places are limited.